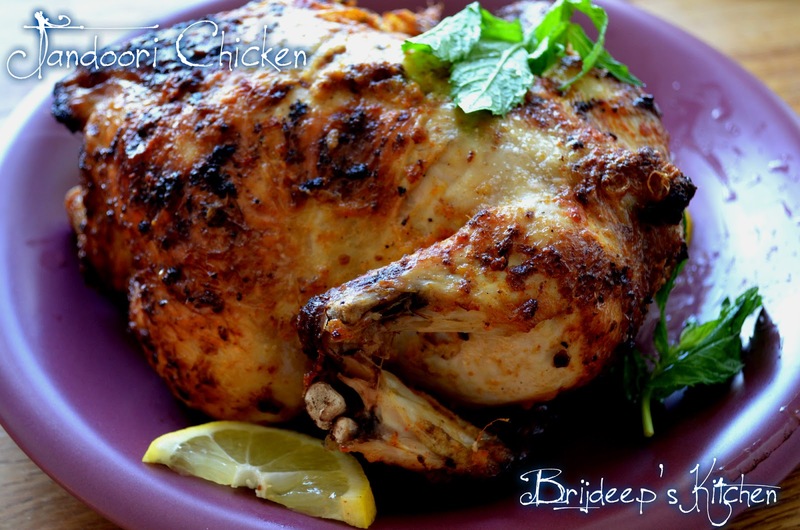 Tandoori Chicken is a popular North Indian dish, consisting of roasted chicken prepared with yoghurt and spices. The name comes from a type of cylindrical oven, known as "tandoor" in which Tandoori Chicken is prepared. Belonging to a Sikh family, it was a regular affair in family gatherings/parties in restaurants. But I just have a normal kitchen oven, so I decided to give it a try in here. Even though it cannot taste like the one cooked in a clay tandoor, it still was pretty delicious and wonderful, made us remember the good old days at home. 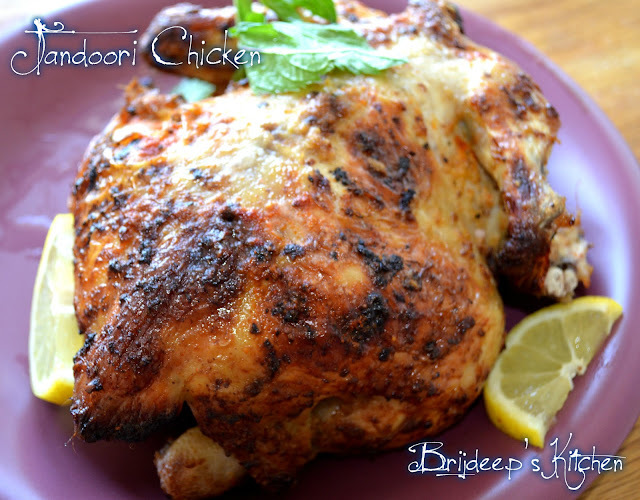 Typically Tandoori Chicken is served just like that, mostly with a spicy Mint- Coriander Chutney. But as it was a main course, I served it with Kaju Curry Korma and Kashmiri Pulao. Dry roast all the dry spices: cumin seeds, coriander seeds, cloves, cinnamon, peppercorns, star anise, whole red chilli and bay leaves. Let cool and grind to a coarse powder. In a big bowl, add the yogurt and mix the freshly prepared garam masala. Add the lemon juice and mix well. Make slashes on the washed and cleaned chicken so the marinate seeps inside. Marinate the whole chicken in this mixture for 24 hours (or at least 8 hours) in refrigerator. Preheat the oven and rub oil all over the marinated chicken. Put the chicken on the grill and let it grill for 20 minutes on 250 C.
Take out the chicken, rub oil again on the surface from all sides and keep in the oven for another 25 minutes at 200 C.
For the third time, take out the chicken and again rub oil. Keep in the oven again for 15 minutes at 150 C. Turn off the oven and take out the chicken. 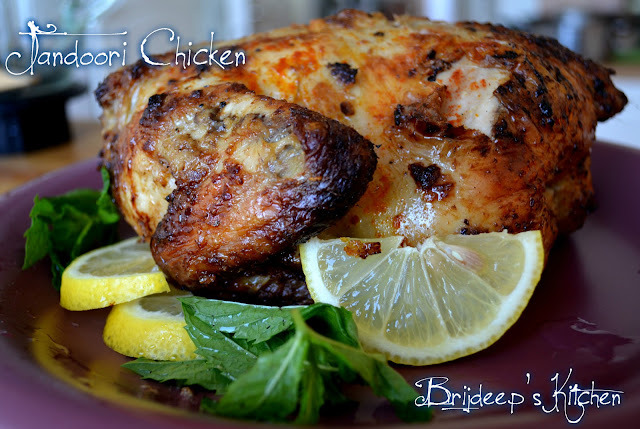 Rub lemon all over the chicken and serve garnished with mint leaves. Loved this recipe? Please leave a comment and feedback in the comments section below; it really inspires me a lot. Don't forget to connect with me on Facebook. Thanks a lot. Sure do try and let me know how it turned out. The whole chicken is with skin or without skin? Wow!! Just wow!! I just ate and I am hungry again. 5 stars all the way from Pakistan.